The year was 1893. The banking industry was shaky. 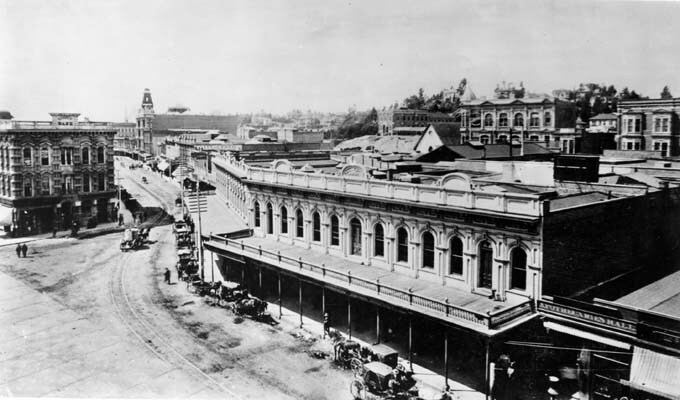 Hellman, who founded the Farmers & Merchants Bank in downtown Los Angles, was in San Francisco on business. His brother sent word for him to come down to L.A. There was a financial crisis. Hellman, who also founded the Nevada State Bank in San Francisco, didn’t get rattled. He was calm and rather unassuming for a man who had invested in early Los Angeles banks, real estate and railroads. After a second notice, Hellman got on the train which stopped in Los Angeles about 24 hours later where he was met by a Wells Fargo stagecoach. The delivery men carefully loaded his large satchels onto the stage, then drove them and its owner to the Farmers & Merchants bank in downtown L.A.
Hellman was met with a line of anxious customers who wanted to withdraw their money. He began stacking the gold he brought from San Francisco –his own money — on the bank counters. This calmed the crowd and stopped the run. Leadership like Helmans prevented a financial crisis from getting worse and helped build Los Angeles into a prosperous city. Here’s hoping today’s leaders — in Washington and in L.A. and Sacramento — are just as successful. Dinkelspiel was full of amazing stories like this, including how Hellman helped Henry Huntington invest in light-rail in the early 20th century Southern California. 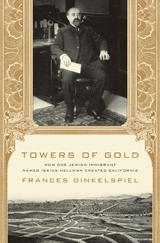 The title of her book, “Towers of Gold” is taken from this incident. As if California needed more bad news…. there was this that came across my desk on Friday. A report from UC Berkeley quantified the state’s real estate losses should the full effects of global warming be realized. Assembly Speaker Karen Bass has a request for President George W. Bush: Show me the money. She is drafting a letter to the lame duck president, asking him for a $5 billion “cash infusion” (read: bailout) so the state doesn’t have to make drastic, mid-year cuts to education to fill a gaping budget deficit. “One of the things we definitely need is descretionary cash,” she told a packed ballroom at the Millennium Biltmore Hotel in downtown Los Angeles today. Bass was the luncheon speaker for the 16th Annual California Policy Issues Conference held by the Edmund G. “Pat” Brown Institute of Public Affairs. Her reasoning is well, creative. She wants the president and the Congress, which is considering a new stimulus package for funding public works projects, as well as a bailout for the U.S. automakers, to think of California not as government, but as industry. “We need to look at the state as an industry,” said the Assembly speaker. The federal bucks would be on top of raising state revenues through a 1.5 cent sales tax hike, by bringing back the vehicle license fee, taxing oil companies for extracting crude and hiking the state income tax. Though the numbers are still quite fuzzy, Bass indicated in answering a journalist’s question after her remarks, that if the state got a federal bailout, it would not have to “decimate education” with draconian cuts. A reporter asked her if that request has been made known to President Bush or anyone in Washington for that matter? Bass said California did not create this problem alone, but the state budget is bleeding red ink — about $27.8 billion by June 2010 — because of the record rise in housing foreclosures and the international credit and financial meltdown. “This is not just California’s problem and so it should not just be California’s solution,” Bass said. Twenty-nine states face budget shortfalls, including the Golden State. We’ll hold the presses on that one. Still, it should be interesting to see if Bass has that kind of influence in Washington, a place that usually has a motto when it comes to helping out California: ABC for Anyone But California. Either way, California will have to get in line to receive the next federal bailout. “Historical. Change. Amazing,” I uttered. Walker, who lives in Covina but is a fixture in Monrovia both on his KGEM talk show and at the Obama for President table during the Monrovia Family Festival on Friday nights, started talking about Obama’s army. The dedicated volunteers who mobilized on the ground for the candidate was an efficient, unstoppable force. As Obama said during his acceptance speech, they did a phenomenal job. “It’ll be interesting to me to see how Obama will be tapping into that electric current … it is a standing army. Now that they’ve achieved their goal, they are waiting for what’s next,” he said. Walker, who is African American, has been an Obama volunteer for 18 months. He began by putting an item in this newspaper (and on this blog) about a meeting in “the little green shack” in Monrovia’s Library Park. Six people showed up that first Sunday and the multi-racial and multi-ethnic group of Obama volunteers grew from there. Since then, they’ve registered more than 2,000 people to vote. Walker said he spent endless hours phone banking and knocking on doors. Some of the responses he received included “Why don’t you go back to Africa,” he said. “In my younger days, I would’ve punched someone in the mouth. But not this time,” he said. Instead, he endured racist remarks with the hope that this day would come. And on Tuesday, it did. America elected a black man as president. While it still sinks in for the Valley’s African Americans and other people of color, and white people as well, the question for the Obama volunteers is what should they do next? Ralph will be back at his Obama table Friday night at the Monrovia festival. “I guess I just want to look at the faces,” he said. If today’s presidential election was determined by children, Barack Obama would be the winner. That according to Studies Weekly/Woogi World, makers of children’s textbooks and kid-friendly Internet tools, who conduted a poll of the nation’s school kids in all 50 states. The kids picked Obama over Republican John McCain by a vote of 473,919 to 333,092. The kids who voted were between the ages of 6 and 12. “This is a significant sampling of children’s opinions across the country. We had high student participation in all 50 states in the country” said Ed Rickers, President of Studies Weekly. Well, good for them. Nothing like starting them on a hands-on course on democracy early. Next on the kids agenda will be a vote on playground equipment, followed by a survey on homework and schoolyard bullies. (I made that last part up). From my tiny neck of the woods, voting went swimmingly this morning. I walked into my precinct in south Temple City, found the correct “table” and told the bevy of volunteers my name. I signed the book, got my ballot, put it into the inka-vote system, snapped it over the two pegs on top and began marking away. When I took out my ballot, I checked to see if had black dots; it did. I felt secure that my vote counted. The people were even nice. Like the young woman, a student at Temple City High School who asked if I was related to Andy Scauzillo,. “Yes, that’s my son.” She said, “Yeah, I know him, I play basketball.” (Andy plays forward/guard on the TCHS Varsity basketball team and is sports editor of the high school newspaper Rampage). He was busy directing voters to the right table and was keeping the line moving. This is a multi-precinct location, so each table has an aggregate of registered voters. It makes the lines go quicker (sort of like many cashiers at McDonalds). I encountered three people waiting as I walked in at little after 9 a.m. The whole process was quick, easy and greatly satisfying. I would highly recommend it if you haven’t done so already. I even prefer the showing up in person and voting on election day routine. There’s just something very democratic about seeing your fellow voters in the multi-purpose room of a church/school. As I left, a steady stream of cars were turning into the parking lot. I slapped the “I voted” sticker on my chest, puffed it out and walked to my car.